Cartoon Network is at it again with another 16-cartoon collection aimed at undiscerning fans who NEED some episodes NOW and are not concerned about bonus features and complete season sets and story continuity. The new grab-bag of Adventure Time cartoons has a special hook this time: the title episode "Princess Day" is brand-new. In fact, if you buy this collection on the street date, you get to see the cartoon two days before it airs on TV! Ah... If only "Princess Day" was a better episode... It's not awful, and it actually sets the tone for this set pretty well, but it doesn't justify Cartoon Network's excited rush to get it out in the marketplace. Wait. First, let's back up. For the uninitiated, I am going to copy and paste my little show recap from the review I wrote for the show's last grab-bag compilation, The Suitor: Adventure Time is a hipster-friendly amalgam of classic mythology, alternative comedy, unabashed surrealism, and the '80s films of Amblin Entertainment. The setting is the fantastical land of Ooo -- which, in a particularly dark bit of backstory, might actually just be the planet Earth several hundred years after an apocalyptic war. There are a number of different kingdoms, one of the best being the Candy Kingdom, populated by sentient sweets and ruled over by the perpetually teenaged Princess Bubblegum (Hynden Walch). Elsewhere can be found other rulers, like the villainous but dopey Ice King (Tom Kenny), Marceline the Vampire Queen (Olivia Olson), and the self-involved Lumpy Space Princess (show creator Pendleton Ward). The heroes of the show are the constantly adventuring 13-year-old Finn the Human (Jeremy Shada) and his shape-shifting buddy Jake the Dog (John DiMaggio). This seventh randomized compilation of Adventure Time episodes at least tries to organize its selections around an idea. Princess Day is billed as a collection of episodes about the show's princesses -- although it oddly deviates from this seemingly simple idea as the disc wears on. To be accurate, Princess Day should be summed up as stories about princesses and/or strong female characters and/or royalty in general and/or male-female relationships. To be fair, even though this compilation doesn't stick strictly to its premise, most of the digressions are welcome. Lumpy Space Princess is featured on the front cover of the DVD, and she takes center stage in a number of the included episodes. 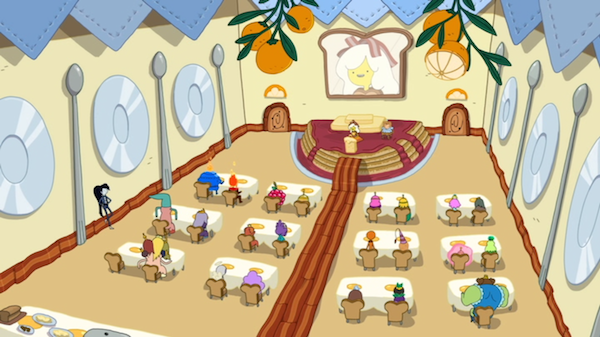 In "Princess Day," LSP crashes a princess meeting taking place in the Breakfast Kingdom. After being ejected, she and Marceline take revenge on the snooty Breakfast Princess by stealing and eating stuff from her room. 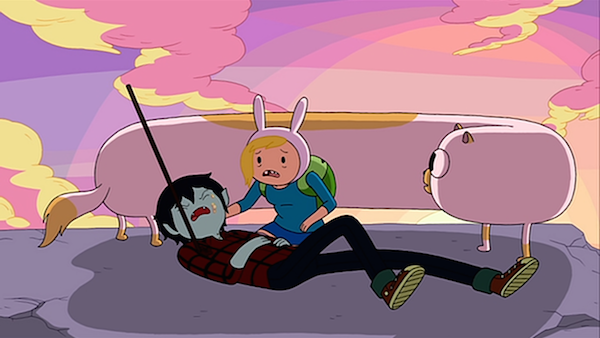 In "Candy Streets," LSP's melodramatic love-sickness inspires Finn and Jake to begin a Law and Order-style investigation to get to the bottom of it. 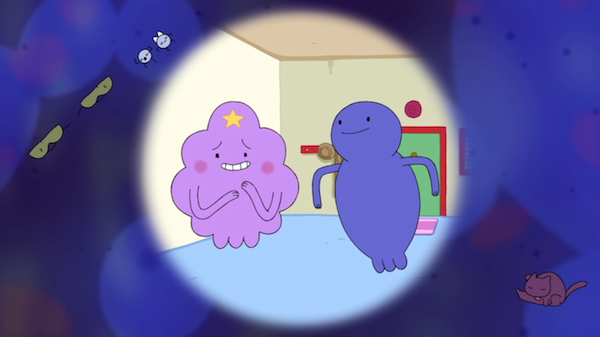 Though LSP is frequently a lovable buffoon, the time-travel episode "Bad Timing" frames her self-involvement and frantic desire to be loved in a way that's surprisingly devastating. In fact, for a show that is essentially about adolescent fantasy, the newer episodes seem to focus more and more on real-life emotions. Finn's attempts to recover from a break up with his girlfriend, Flame Princess (Jessica DiCicco), is the backdrop of a handful of these stories. (Of course, in the typical continuity-shredding tradition of these mixed-up compilations, the episode "Hot to the Touch," where Finn first tells Flame Princess that he likes her, appears out of order near the end of the disc.) The episode "Love Games" exploits Finn's heartbroken predicament particularly well, by placing him in an incredibly awkward situation where he must act like he loves Slime Princess (Maria Bamford) so that she can maintain her throne. The Ice King's deluded love of princesses serves as the basis for a particularly sweet episode, "The Party's Over, Isla de Se�orita," where he flees to a secluded island that turns out to also be a living lady (Garfunkel & Oates's Riki Lindhome) with whom he can commiserate. Unfortunately, Ice King's delusion is also highlighted in one of this collection's few real misfires, "Princess Monster Wife." In that episode, Ice King steals parts of various princesses' bodies (an arm here, half a head there) and stitches them together to make a loving wife. Conceptually, "Princess Monster Wife" isn't bad, but realized on screen, its gruesome execution is too unnerving to be funny or effective. Fortunately, many more of the included episodes are excellent. The majority of the stories here (nine, to be precise) are taken from the show's extra-long fifth season, which is probably the show's strongest. The remainder consists of the new sixth season episode "Princess Day," three episodes from season 4 (which is being released as a complete season set in October), one episode from season 3, and two episodes from all the way back in season 2. And one more thing: in addition to Maria Bamford and Riki Lindhome, whom I already mentioned, this collection has plenty of guest voice appearances by well-liked comedy people, such as John Hodgman, Rainn Wilson, Donald Glover, and Andy Milonakis. Once again, Cartoon Network gives us a great standard-def presentation. The widescreen 1.77:1 image has vibrant colors, strong black levels, and no major compression issues, apart from the occasional jagged line. Another solid batch of Dolby 2.0 stereo mixes, with English SDH for readers. Another Little Did You Know character gallery, this time focusing on five of the show's princesses. Princess Day is an overall strong batch of episodes that is at least vaguely thematically linked. I do wish that whoever curates these episodes would not have mixed up the chronology within the disc, robbing certain episodes of their context, but that doesn't completely detract from this solid crop of shows. If you're the kind of fan who prefers to stick to the complete season sets, then you already know to skip this. For the less obsessive, this set comes Highly Recommended.